Does your inner arm fat bother you? Flabby inner arms are the most difficult areas to workout and unfortunately one of the most ignored areas too. However, if your inner arm is not toned or strengthened, it can actually hamper your performance. This is especially in the case of sportsperson and athletes who need to give special attention to these muscles. There are a few exercises which help in focuses on the inner arm muscles, help in reducing fat from the area and work to tone the muscles. 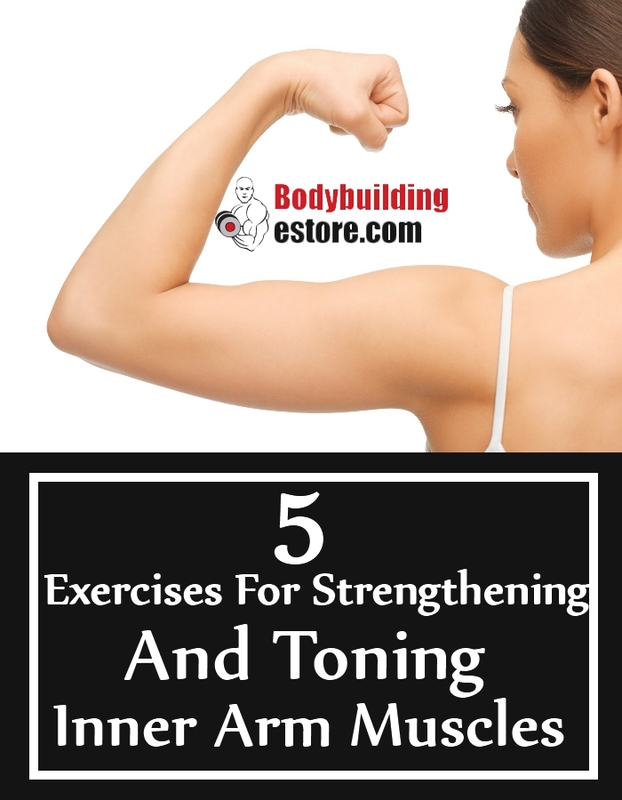 These exercises should be an integral part of your workout schedule, whether you have the problem of inner arm muscle flab or not. This exercise is known for working out the chest muscles mainly but it is effective in working on the various inner arm muscles. As you start, lie down comfortably on one horizontal and narrow bench. You will have dumbells in your hand. Start by extending your arms just above the chest. You need to bend a bit from the elbows. You can again lower a bit, and pull down the weights. You can move the weights to your sides, till the arms are in a horizontal position. You need to exhale at this point. Slowly move your arms back, high and vertical as you are able to squeeze the chest muscles, just towards the end of this movement. Remember, not to do this workout with heavy dumbbells. You should do with light weights. You need to repeat 10-12 times and in sets of two or three. This is another easy and effective exercise which helps in tightening the inner arm side muscles. It also helps in strengthening the arms. You need to start the workout in one pushup position. Your primary weight shall be on the forearms. Your elbows and toes will be just under the shoulders. Your neck has to be in perfect line with the spine. You need to breathe in continuously as you do the workout. Stay in this position for at least 20 seconds. You can get back to the start position. Rest for at least 30 seconds. You can again repeat the forearm plank at least three times as you workout. This exercise helps by isolating the specific medial head of triceps brachii which are an important part of the arm muscles. This muscle usually runs through the inner section of the arm and helps in strengthening the specific muscles. You need to stand in a comfortable position, as you face a high-cable machine. Keep your arms completely bent. They should be comfortably tucked and placed close to the body. You can hold the specific handle with your good underhand grip. You can again stabilize the torso and keep the elbows tucked comfortably. You can again contract the triceps and extend the arms. You need to pull the handle close to your hips. You can again get back to the start position. You can do at least 2-3 sets, each of which will be of 12 repetitions and with great resistance. This is a common and easy exercise which effectively works out the inner arm muscles. You need to start the workout in a standing posture. Your feet shall be at least shoulder distance apart. You will need 5-lb dumbbells in each of the hand. You should stand by bending the right arm carefully and make a 90-degree angle. You can again curl the right arm to your shoulders. You should again lower the arm and get back to a start position. 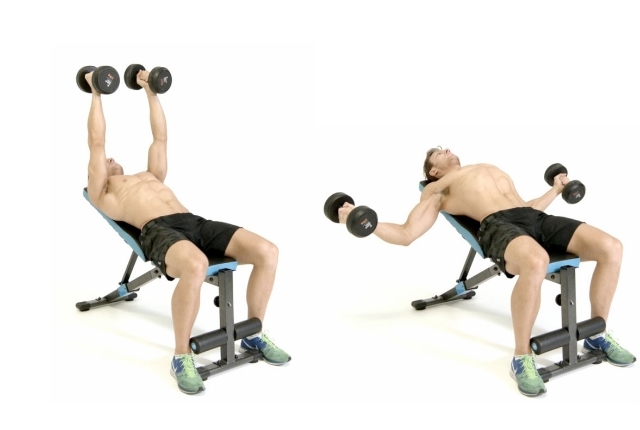 You should ideally repeat these dumbbell curls at least 8 times on your right side. You should again repeat 8 times on your left side. Once you have done the movement 8 times on your each side, you should bring the arms close to your shoulders. You need to curl in this position at least eight times. This exercise is done in a lying position. You should lie down comfortably on a bench. You will hold one pair of dumbbells, just above the head. Be careful to be comfortable and not feel too much of a strain. Keep your arms straight and your palms shall face one another. You shouldn’t move the upper arms. Bend the elbows a bit and slowly lower the dumbbells till they are moved to a side of the head. You need to wait for some time and then lift the weight back and get back to your start position. This will be one repetition. You need to do 10 such repetitions every time.